Clear plastic two piece display case for a regulation size football made by BCW (Exterior dimensions 7 1/2 X 11 3/4 X 7 3/8 inches; interior dimensions 7 X 11 3/8 x 7 inches). 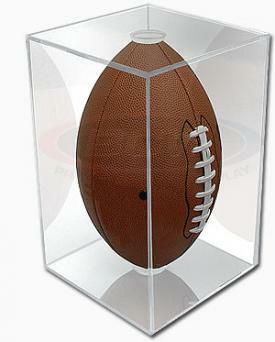 DISPLAY CASES ARE NON-RETURNABLE. DUE TO THE SIZE OF THIS CASE, IT CANNOT BE SHIPPED OUTSIDE THE UNITED STATES.